Salt Spring Island Brewing is one of the few breweries that would feel out of place most anywhere else. The rugged, isolated treehouse-like location evokes a hiked-in picnic that doesn’t square with an urban setting. There are few breweries where someone could show up barefoot and ask whether they can reuse a 1L bottle as a growler (yes) and no one bats an eye. It feels very authentic, in that the beers they make are neither trying to go with nor break against trends – they’re just tasty and interesting. The distinctive Crème Brule Vanilla Stout balances the namesake sweetness better than expected, the unique Heather Ale is exceptionally delicate for its style, and the floral notes of the Earl Grey IPA makes the hoppiness very palatable (without coming off as stale, malty tea like many beers that try something similar). They’re experimental with gruits and locally-sourced creations (any good nettle ale merits recognition) with a solid line up that’s still accessible to broad tastes even if it’s only a few beers that are noteworthy. 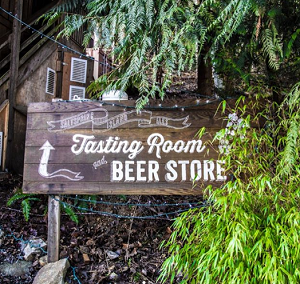 If you’re a craft beer nerd, you’ll appreciate the beers, and if you’re just on Salt Spring for a vacation, you’ll enjoy the atmosphere and expand your beer horizons at the same time. It’s a lowkey space with lowkey beers that could hardly be more Gulf Islands. Which, like the Gulf Islands, may not jibe with you, but they’ll keep doing their thing independent of what the scene is doing in Vancouver and Victoria, and not care less. Hmm. I think the rustic locale must be the point for Salt Spring Ales. The fact that I couldn’t have 2 flights in order to sample all their product was disappointing. How often an I going to get there?